Week ninety four and my bake was done in two parts this week. I delved with glee into Mary Berry’s Baking Bible and found the chocolate swiss roll which I made at the weekend and then the Great British Bake Off inspired me to try May’s dobaz torte…. Firstly the chocolate swiss roll, I used my new all singing all dancing stand mixer to take up the strain of the mix and the only effort I had was to melt the chocolate over a bowl of hot water! 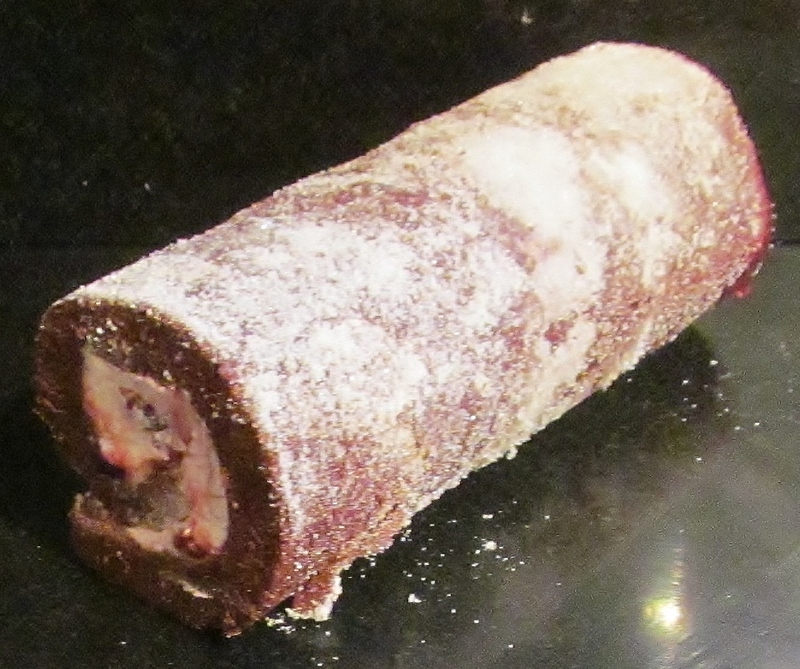 I lined a swiss roll tin and poured the mix in. Into the oven it went and I set the timer, put the kettle on, made a cup of tea and put out a sheet of grease proof paper sprinkle with caster sugar ready for the baked sponge. Meanwhile, I read the next steps and whipped the cream ready for the next step. The timer pinged and I got the sponge out, tipped it carefully out onto the sugar coated paper and carefully peeled the lining paper off. Finally I rolled the sponge into a roll with the grease proof paper rolled up with it and left this to cool. Finally I was able to warm thejam through- Mary suggests blackcurrant jam but I found a lovely conserve by Bonne Maman – berries and cherries conserve which was so nice with the chocolate sponge and cream. I unrolled the sponge, spread the jam and cream in it, rolled it back up and cut it in half so that the chief tasters would get their part. The second bake I made midweek on a day off, while having a new carpet laid in the lounge. It all sounded so easy, go to shop, order carpet, ensure room is empty…hold on, where do we put all the furniture-borrow groundsheets from chief taster, move most furniture into the garage and place on groundsheets, take up old carpet and underlay and notice that the paintwork and walls all need wiping. Spend the baking day wiping paintwork down and waiting for the call from the fitters. I read Mary’s recipe which says to mark circles on grease proof paper, make the cake mix and spread onto the circles and bake in batches. This was not too difficult and I soon had 6 weirdly flat sponge circles done. Carpet fitters arrived. Next step, make butter cream- use stand mixer to soften and mix butter. Meanwhile over a pan of hot water mix the eggs and sugar with an electric hand whisk while the carpet fitters go back to the warehouse to get the right underlay! Keep whisking the mix while walking to the lounge window to ensure the fitters aren’t back yet as the mixers are noisy and I can’t hear the door bell. Finally add this mix to the butter and melt chocolate over the pan of hot water and add to the butter cream. Mix again. Carpet fitters arrive- ( They make me feel really old!) and I read Mary’s instructions about making the caramel. I add the water and the sugar together in a pan and heat gently then allow to boil. 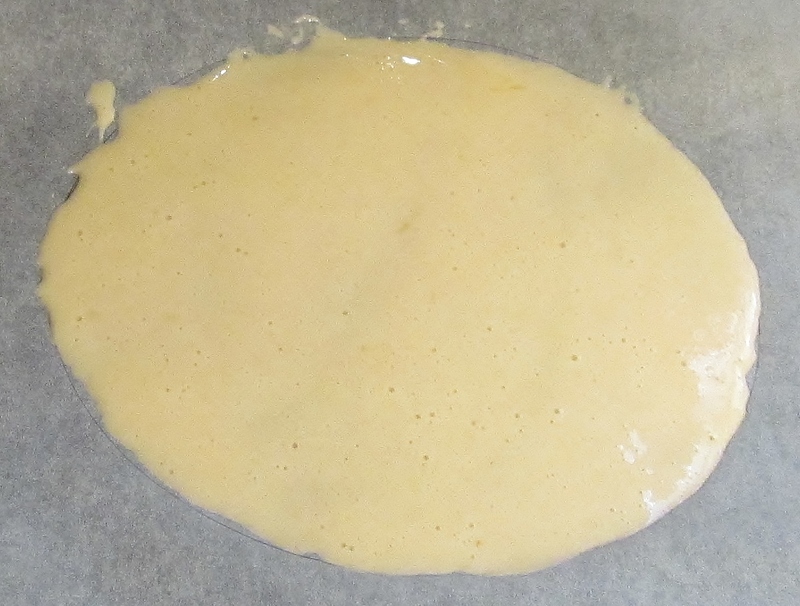 When it changed colour, I poured some over one of the sponge layers and the rest on a sheet of grease proof paper. Carpet fitters seem to lay underlay and carpet super quick and I leave the cake to put together later. Vacuum lounge and begin to put room back together again- fail dismally and end up with the essentials for the night- TV and sofa! Take a few hours off work the next day, put the cake together- sandwich the 5 sponge layers with butter cream, spread butter cream around the sides and roll in the caramel that you are supposed to crush with a rolling pin from the day before- slight problem, caramel too sticky, won’t crush. Hubby makes a batch, sets well but tastes burnt so plan C- grated chocolate. 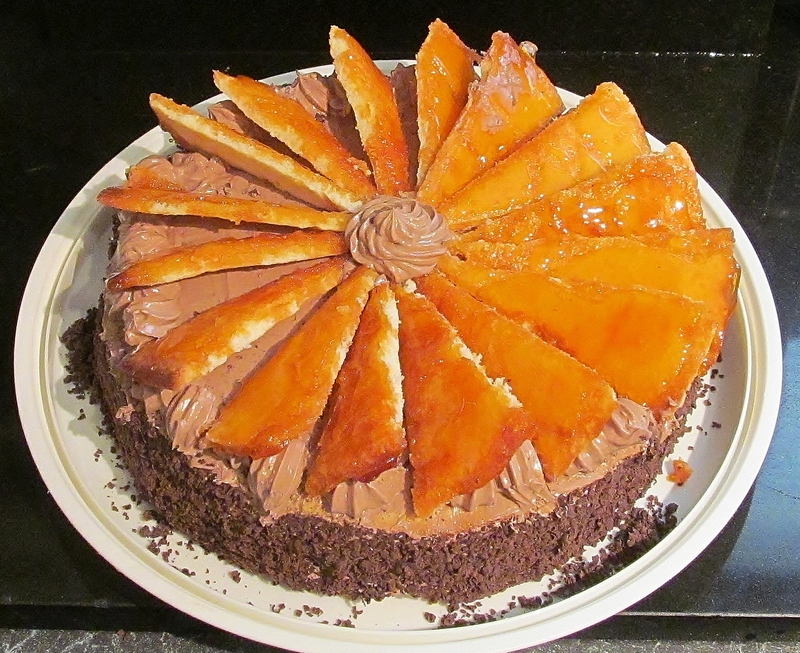 Sides suitably covered, decorate the top of the cake with the caramel covered sponge cut into slices. finish with a swirl of butter cream and give to the chief tasters for their 49th wedding anniversary! PHEW…. The dobaz torte was a fiddly cake to make and probably not one that I would re-visit but another one ticked off the list…and the countdown now stands at 80 recipes left to bake. This entry was posted in Kim's cake challenge and tagged Baking Bible, Buttercream, chocolate, dobaz torte, Great British Bake-Off, Kim's Cake Challenge, Kim's chocolate swiss roll, Kim's Dobaz Torte, Mary Berry, Mary Berry's Baking Bible, Mary Berry's chocolate swiss roll, Mary Berry's Dobaz Torte, Swiss roll by kimsideas. Bookmark the permalink.